Buried among the dozens of throwaway reality shows cluttering up the summer schedules is one scripted program with a serious pedigree. THE INSIDE (Wednesdays at 9 on Fox), a stylish and creepy addition to the violent crime-solving genre, boasts a sterling staff of writers and producers from shows like Buffy, The X-Files, and 24. And although the series theoretically revolves around a blonde novice FBI agent named Rebecca Locke (Rachel Nichols), the real attraction is co-star Peter Coyote, who plays her Machiavellian supervisor Virgil "Web" Webster. Web takes only the most emotionally punishing cases, exploiting his own employees' vulnerabilities; his relationship with Rebecca promises to be particularly twisted. Coyote explains in a telephone interview, "It's not a lab show. You don't have people saying, 'Let's flush this with five cc's of dexothorpan.' This is about unexpected turns the human mind can take. Each character has personal and ethical limits, except Web. Just when you think he has rendered himself completely corrupt, it turns out he's ahead of everybody." Coyote spent many years pushing limits in the counterculture—as a member of the '60s anarchist group the Diggers and a denizen of various communes. He remains a political activist, regularly supporting lefty causes and documentaries. So why does he end up with so many cop and sheriff roles? 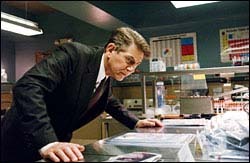 (In last season's USA miniseries The 4400, he even played a Homeland Security chief.) "For some reason, casting people and directors see me as the Robert Vaughn of my generation," he says dryly. "I guess it's just an irony of history." But he's enjoying The Inside, not least because of his longtime interest in serial killers. "I spent a lot of my life hanging around outlaws, some of whom were extremely dangerous—a few were actually murderers. These are people who don't have internal restraints, and I think it's fascinating to look at where the difference is between them and me. To find the line I refuse to cross."